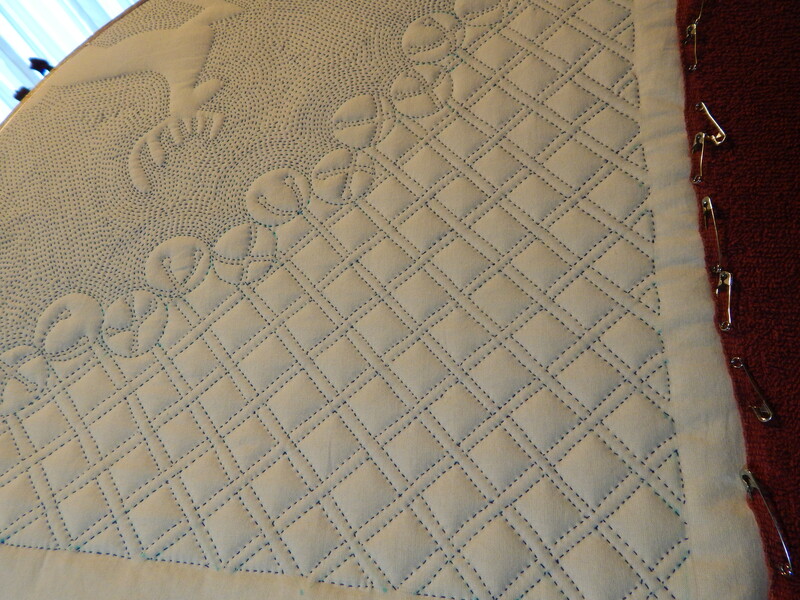 I am getting close to 1/4 done on the snowflake quilt. I am working on the corner. 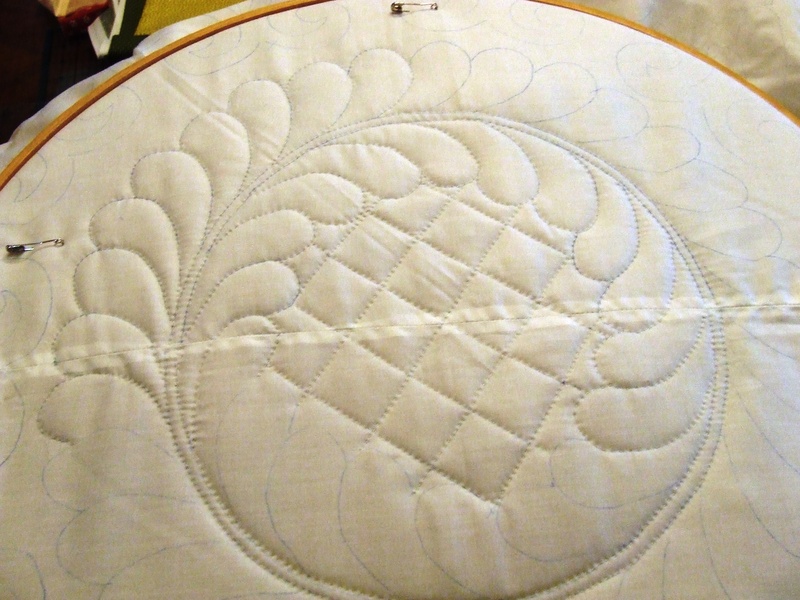 In order to get the quilt in the hoop and be able to quilt the edge and corner I pin towels to the edges of the quilt so that The square corner fits into the round hoop. 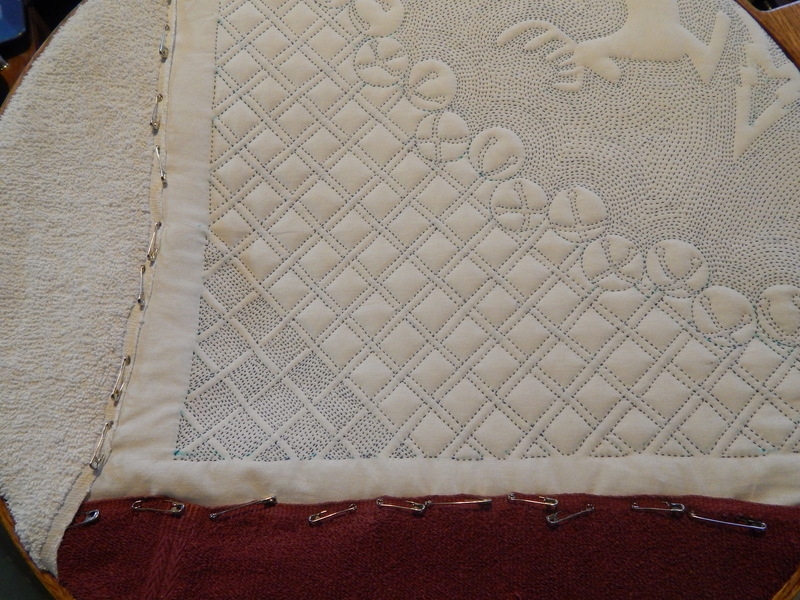 A towel works better than plain fabric because it is thicker and keeps the quilt from slipping in the hoop. 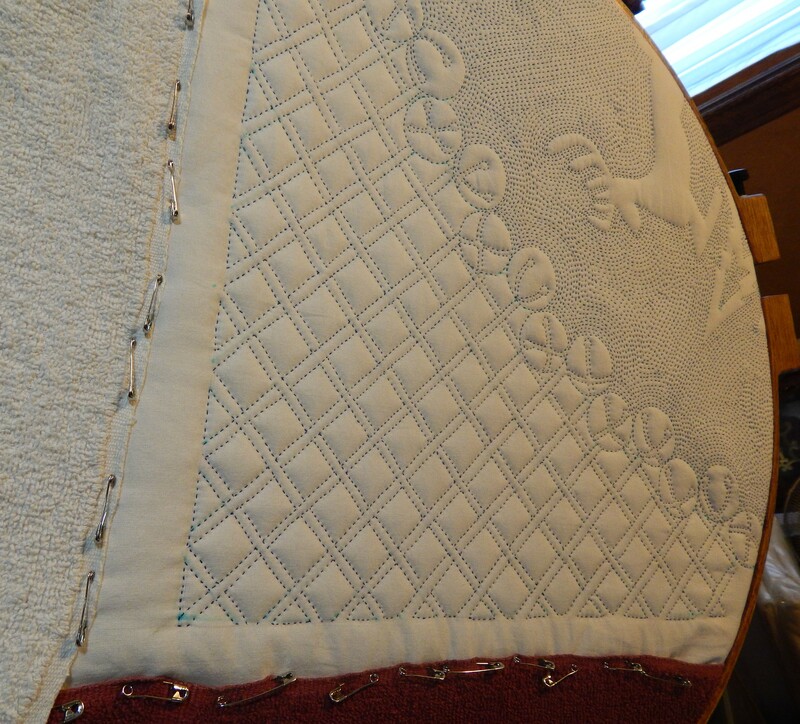 Here it is out of the hoop ….the quilt gets somewhat creased and wrinkled from the hoop but it will all flatten out nicely once it is done and blocked. 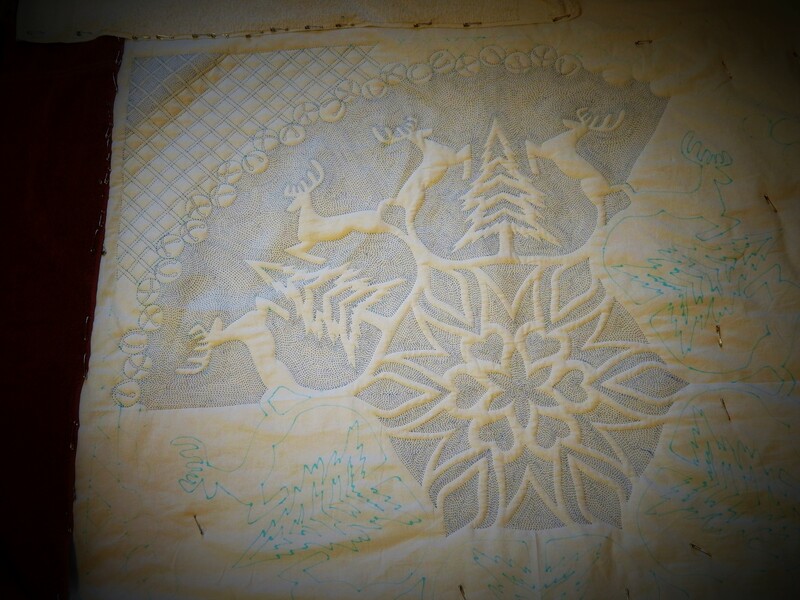 This entry was posted in Quilts and tagged hand quilting, Quilts, snowflake quilt. I was wondering how you were going to quilt the edges. I love the jingle bells …. AND how your mind works! Amazing bells and the background is perfect! So when you get this one done, then I will send the address where you can send it. love those bells! this will be an amazing quilt. 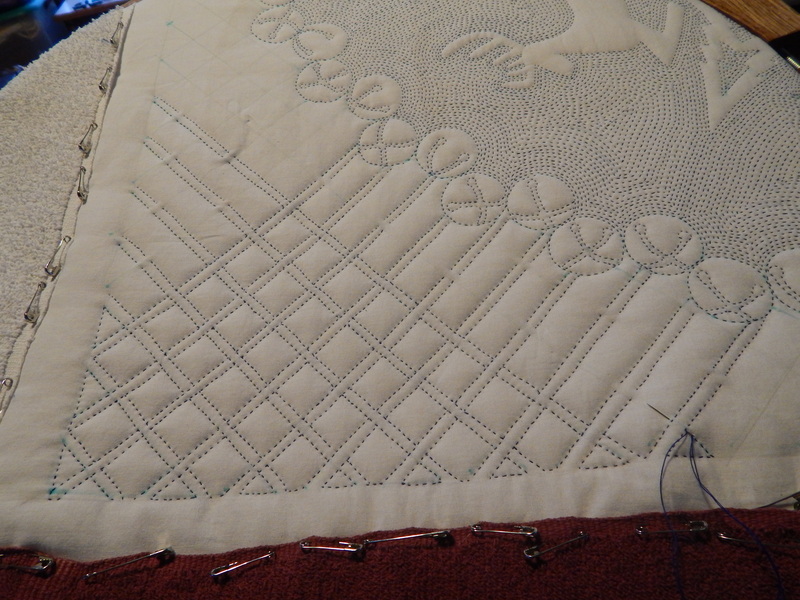 This quilt is going to be amazing….it is really taking shape with some pretty awesome quilting! 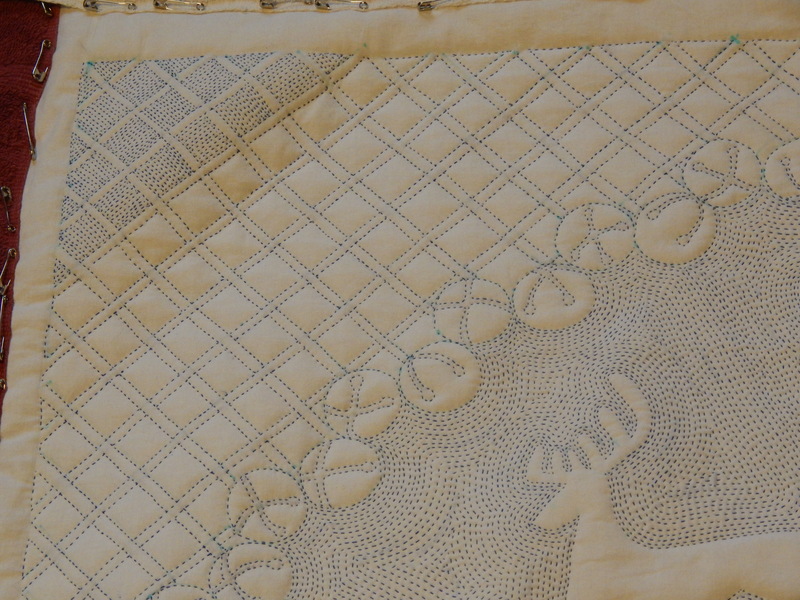 I love how plumped out and rounded the reindeer look; all that close quilting really does make the rest puff up beautifully. I am absolutely loving the process. The quilt is just beautiful. Did you say you already submitted for Des Moines — or Chattanooga? I think Des Moines. Anyway, I think you should submit this one for the AQS the closest to Christmas next year. 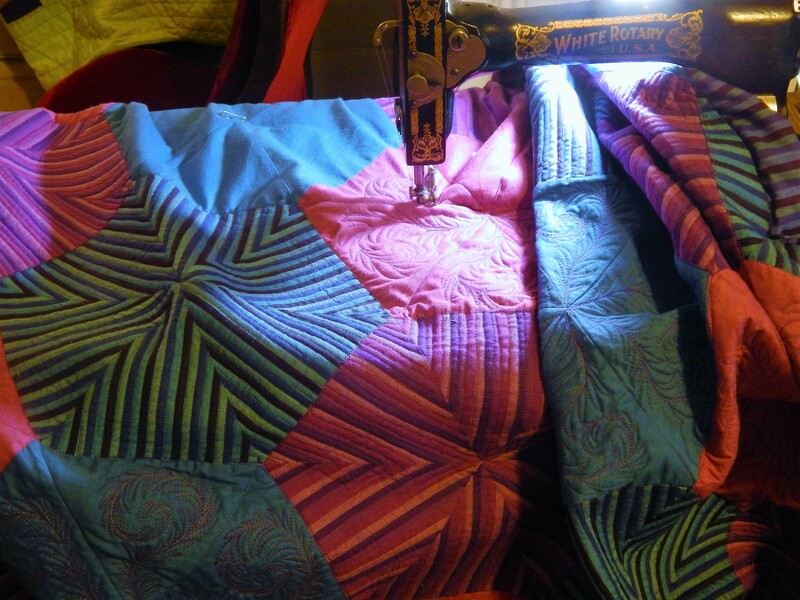 that would be New Mexico ….the deadline for submitting a quilt is Sept 19….think I can finish? Oy, that would be pushing it. Better to enjoy the ride to the finish. 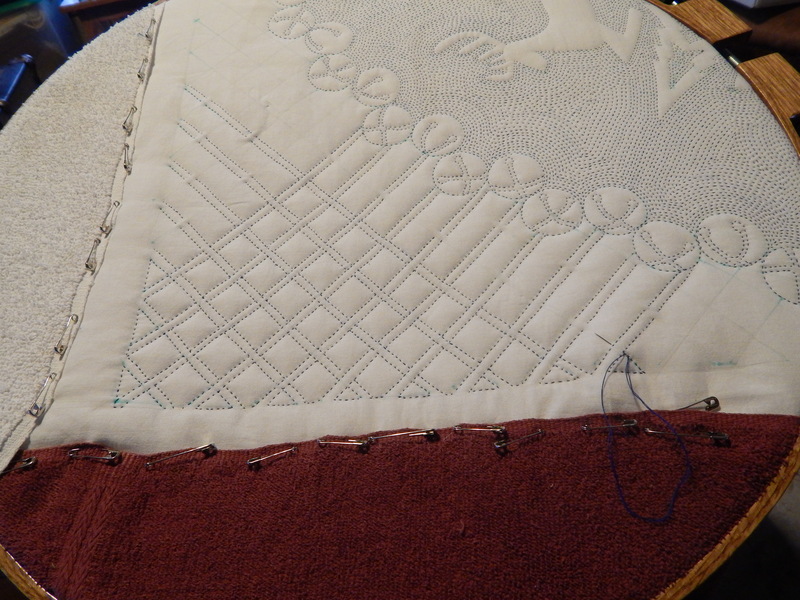 You should the Paul Masson of quilting — finish no quilt before its time. This just gets better and better. Great jingle bell pattern! And thanks for the tip about using towels. I’ve used folded muslin but have never been satisfied with it for keeping the edges in the hope. did i say before that you are amazing? 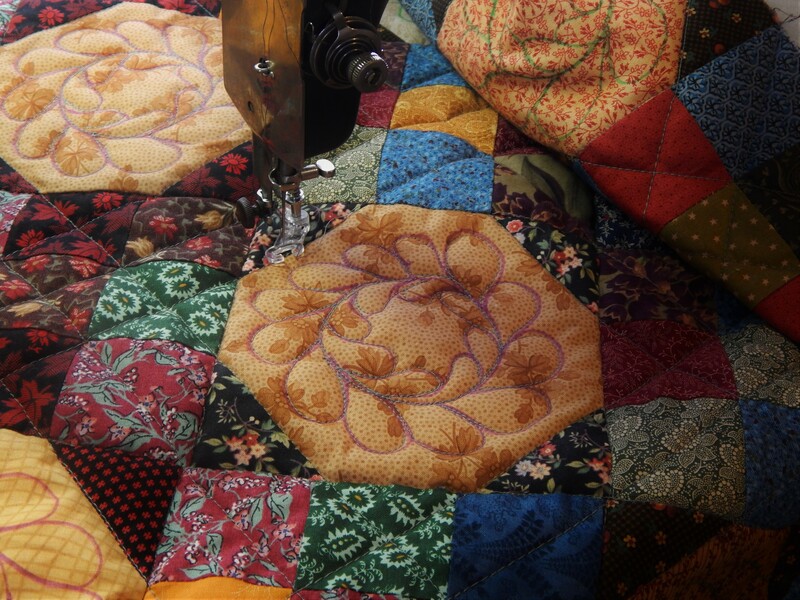 I purchased an antique quilt top a while ago with the intention of hand quilting it. my girlfriend basted it on her long arm. and it has sat waiting for my needle. you have inspired me to bring out the quilting hoop again. ps…you do amazing work, just in case i did not tell you that before! 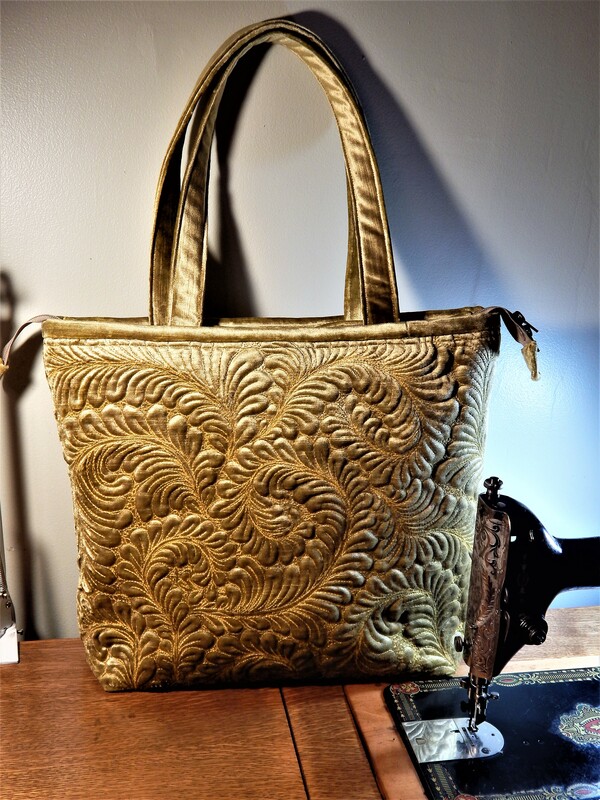 🙂 Thanks…and Have fun hand quilting that antique top!! This is awesome. I toy with the thought that I will tackle a wholecloth quilt one day. You give me inspiration. Thanks! I wish that I was half or even a quarter as talented as you are. Plus wish I had the time. Maybe after canning, back to quilting. I haven’t done canning for years…..some day I want to get back to it….first I need a garden with a lot more sun so i can grow things to can…..